Ball jars (Grocery stores, like Publix, Kroger, Safeway carry them, as do some big box stores - about $8 per dozen quart jars including the lids and rings)Cherry pitter: without one of these, it's pretty hard to remove the pits from a fresh cherry. You will need about 6 quarts of finely chopped, pitted cherries (which is about 18 pounds or 12 quart boxes of fresh whole cherries). Clean and pit your cherries, add the cherries to the crockpot along with spices, sugar and vanilla. Cook on low for 12 hours stir and see if the mixture has reduced to 2/3. Use immersion blender and make smooth. To thick? Add apple juice. To thin? cook longer. If the crockpot isn't keeping the cherry butter boiling hot, you will need to briefly return the butter to the stove to get it hotter. It varies from crockpot to crockpot. I find that if I set my crockpot on high for the 15 minutes before I fill the jars and stir frequently, it gets it boiling. Fill the jars to within ¼-inch of the top, wipe any spilled cherry butter of the top, seat the lid and tighten the ring around them. 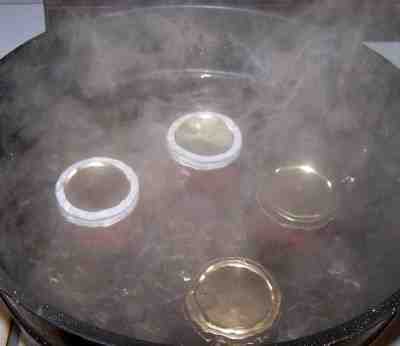 Process means put them in the canner and keep them covered with at least 1 inch of water and boiling. if you are at sea level (up to 1,000 ft) boil pint jars for 15 minutes and quart jars for 20 min. If you are at an altitude of 1,000 feet or more, see the chart below. There isn't a USDA or Ball recipe for cherry butter, but their directions for cherry jam and cherry preserves are almost identical; this is just cooked down more and doesn't require pectin, so the processing times borrowed from those recipes should be plenty safe;. Recommended process time for Cherry Butter in a boiling-water canner.